IP Result of anti-DHX38 (IP:10098-2-AP, 4ug; Detection:10098-2-AP 1:700) with HeLa cells lysate 1400ug. The protein encoded by this gene is a member of the DEAD/H box family of splicing factors, which are involved in pre-mRNA splicing. The yeast prp16 is an essential splicing factor that catalyzes RNA-dependent hydrolysis of nucleoside triphosphates, acting as an ATPase. This protein resembles yeast Prp16 more closely than other DEAD/H family members and also is a general splicing factor essential for catalytic step II during pre-mRNA processing. 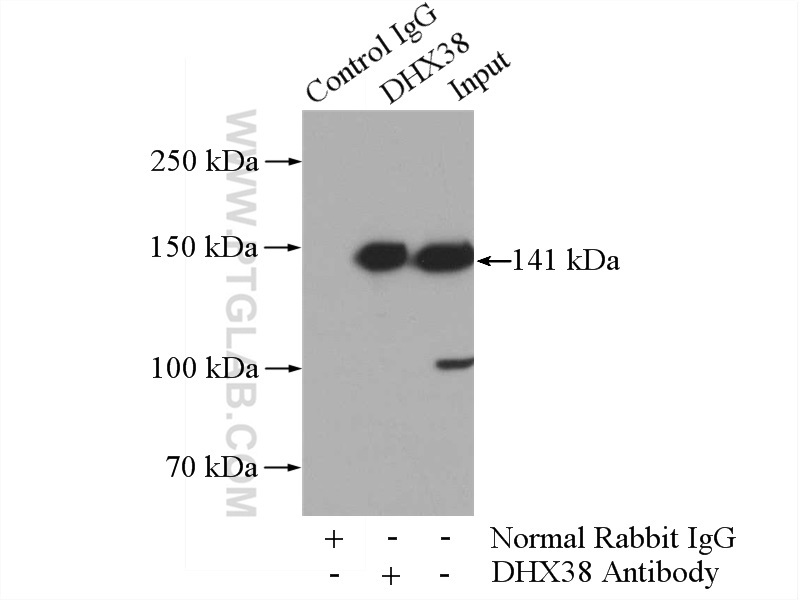 Western blot analysis showed it is a 140-KD nuclear protein expressed in various tissues. Heme oxygenase-1 plays a crucial role in chemoresistance in acute myeloid leukemia. Characterisation of the Epigenetic Changes During Human Gonadal Primordial Germ Cells Reprogramming. Blimp1 associates with Prmt5 and directs histone arginine methylation in mouse germ cells. Reprogramming primordial germ cells into pluripotent stem cells.